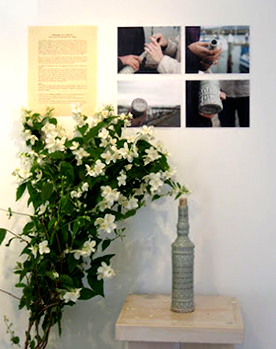 Heather Bourbeau and Liz Worthy are two artists working on a project to highlight the continuing recovering in Fukushima, Japan following the March 11, 2011 devastating earthquake and subsequent tsunami and nuclear reactor leaks. Given the rotating oceanic currents or “gyres”, what happens in Japan will eventually be physically felt on the West Coast of the US, if only in debris, as our footprints are felt on the shores of Japan. 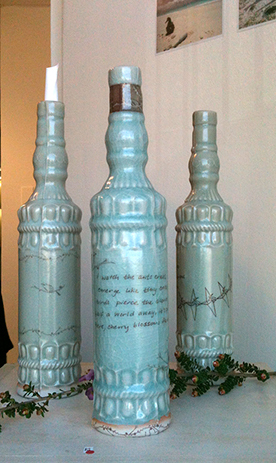 Our project, “Message in a Bottle”, features poems written by Heather Bourbeau using Japanese forms on bottles created by Liz Worthy to demonstrate that we are connected and are not forgetting the struggles of the Japanese, even as the story leaves the front pages. We launched one bottle symbolically into the ocean to mark the anniversary of the tsunami and to hopefully eventually reach the shores of Japan. 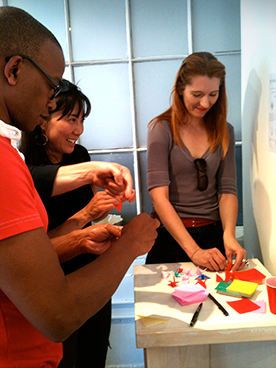 At this show in May 2012 at Ruby’s Clay Studio in San Francisco, we invite you to make origami cranes with your own poems or good wishes to send to our Japanese partners. Proceeds from our show will go to the Japanese Society for Traumatic Stress, which is working with victims and counselors from the area to provide ongoing psycho-social support. To learn more about Heather Bourbeau, please go to www.HeatherBourbeau.com. To learn more about Liz Worthy, please go to www.LizWorthy.com. To learn more about the Japanese Society for Traumatic Stress Studies, please go to http://www.jstss.org/english/.